Can I change part of the content of pdf file then resave it as pdf file again? Yes, you can change part of the content in the pdf file then resave it as the pdf file again. With the help the PDF to PowerPoint Converter v2.0, it only takes a few seconds to finish the convertion on the premise that you have installed the Adobe Acrobat and Reader. Say when you just make a pdf file but you find you make some mistakes in it, you want to correct it then resave this pdf file, you can use PDF to PowerPoint Converter to finish the convertion. PDF to PowerPoint Converter was developed by VeryPDF who has made many software products and nearly all have been used by many big companies. If you have the needs about the convertion from one file format to another, it is worth having a look at here. http://www.verypdf.com/index.html. It will be very helpful for you. 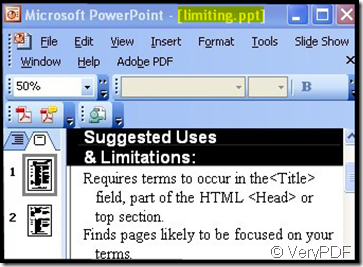 PDF to PowerPoint Converter have many other functions when you use it, please have a detail check , it will be significative for your future use. 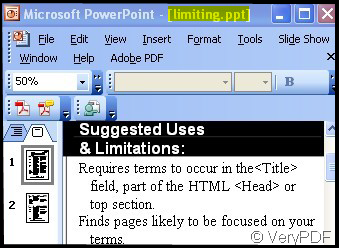 This is the downloading link of PDF to PowerPoint Converter.http://www.verypdf.com/pdf2ppt/index.html#dl If you want to use it, downloading and installing are necessary. Direction for use is given as follows. Save pdf2ppt_setup.exe file and let it run in your computer. Enter interface add file(s) to it. By clicking the button"Add PDF File”. After choosing the menu options and convert it, the pdf file will be saved as a new one. It is a brand new editable and printable ppt file. Now you can change part of the content the pdf file. As the pictures show, I changed the color of the words. Now resaving the changed ppt file is reachable. 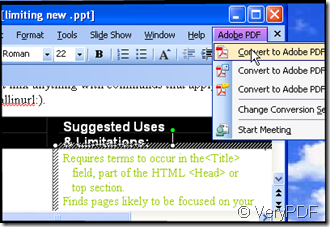 With the help of PDF to PowerPoint Converter, you can change part the of the content then resave is as the pdf file again. However, matters need attention. When you process this order, PowerPoint and Adobe Acrobat and Reader must be installed in your computer. Can I add greek letter as my annotations to pdf files with VeryPDF PDF Editor? 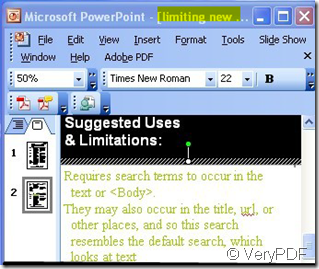 How can I do if I want to convert my PDF file to PowerPoint 2007 format?